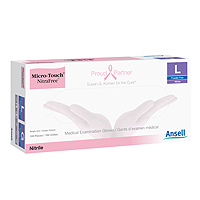 The Komen Nitrile Touch Pink gloves are manily comes without sulfur-based chemical accelerators, helping to protect you from Type I which protects you from latex and Type IV which help you to combat chemical allergies. The nitrile material is soft with more stretch for greater comfort, fit and excellent protection in all risk settings. The glove is a completely non-sterile examination glove. If you can proceed with the purchase of every case then you can opt for Susan G. Komen which cures in support of breast cancer research and awareness. Komen Nitrile Touch Pink glove is made of 100% nitrile. This glove is tested for use with the following 9 chemotherapy drugs Vincristine Sulfate, Doxorubicin Hydrochloride, Cyclophosphamide (Cytoxan), 5-Fluorouracil, Paclitaxel (Taxol), Thiotepa, Methotrexate, Etoposide (Toposar), Carmustine. Would you like to see the Komen Nitrile Touch Pink Label? How about the Komen Nitrile Touch Pink MSDS sheet?